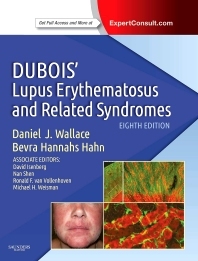 Recognized for more than 45 years as the definitive text in the field, Dubois’ Lupus Erythematosus and Related Syndromes strikes the perfect balance between basic science and clinical expertise, providing the evidence-based findings, treatment consensuses, and practical clinical information you need to confidently diagnose and manage SLE. Broaden your understanding with comprehensive coverage of every aspect of cutaneous and systemic lupus erythematosus, including definitions, pathogenesis, autoantibodies, clinical and laboratory features, management, prognosis, and patient education. Experience clinical scenarios with vivid clarity through a heavily illustrated, full-color format which includes fundamental images of lupus rashes as well as graphs, algorithms, and differential diagnosis comparisons. Section I: What is Lupus? "This is a comprehensive and extensive review of the definition, pathogenesis, serological/clinical manifestations, and current management guidelines of these syndromes. Chapters are organized well, for example, the clinical manifestations section is divided by organ system. Also helpful is the separate chapter on pregnancy in women with SLE, an issue I deal with on a regular basis. This is a thorough reference on lupus erythematosus, covering every aspect of this heterogeneous systemic autoimmune disease. "